written to fit a twin sized bed (82 inches (213cm) tall, 62 inches (163cm) wide. ), with notes on modification to baby blanket or throw sizes. This cozy afghan is knit in modular pieces in garter stitch for a soft, cushy blanket. The modular design makes it very easy to adjust the size for a lap afghan or a baby blanket. You could even change the yarn weight and needle size and just knit it until it’s as big as you want it. It’s also a great way to use up all those scrap yarns! Needles: 5mm (US 8) needle for flat knitting and another 36 or 40 inch circular needle for working borders (see note) or size needed to obtain gauge. Gauge: 18 stitches & 17 rows in 4 inches (10cm) square in garter stitch. Notions: crochet hook of similar size to the needle, tapestry needle to weave in ends. This afghan is worked with modular pieces that are picked up and knitted from the existing pieces, beginning with the large mitered square in the bottom right corner. Each full square consists of a large mitered square, two rectangles and a smaller mitered square that completes the full square. Squares on the left and top edges are not full squares, but consist of one or more modular pieces as described in the pattern. Work each square in number order according to the diagram, working from Square 1 to Square 48. 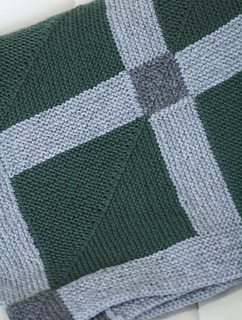 When all 48 squares are complete, a border is picked up and knitted on using the longer circular needle, plus 4 small mitered squares in each corner of the border. For cast ons, use the cable cast on method. See the tutorial video here. Stitches should be picked up as demonstrated in the tutorial video here. 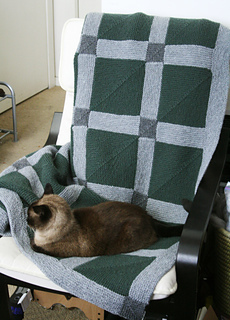 The modular nature of this blanket means it would be very easy to adjust the size either smaller or larger. The yardage required will change if you adjust the size (see last note here). To knit a baby sized blanket, work the modular pieces to be 4 large mitered squares wide and 4 large mitered squares tall. For a lap aghan, work the modular pieces to be 6 large mitered squares wide and 6 large mitered squares tall. The cable of a 36 or 40 inch circular needle might be a bit unwieldy when working the modular pieces, but if you don’t mind the extra cable, you could make do with just the 36 or 40 inch circular needle for the whole blanket. you will know how much yarn went into the modular piece.